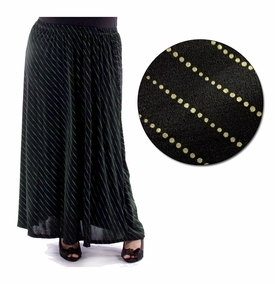 This is a really cute skirt! It is full length, the material is a polyester/spandex blend. It is lightweight, and soft to the touch. The solid black material has a pretty pin dot print. This skirt looks great in the day or at night. Dress it up with a fabulous top and you are ready to go! 5x: Waist= 36", Hips= 64"